Guitars that have never been cleaned. Guitars that have had the same (usually rusty) strings on them since they were first purchased. Guitars damaged because their owner took them hiking or camping with no more protection than a gig bag. It’s all helped me realize something: total beginners sometimes have unrealistic expectations of what a guitar can or should be able to do. If you’re a new, first-time guitar owner, or perhaps very close to becoming one, let’s set some realistic expectations for what this amazing instrument can and can’t do. Holy crap! Take my money and sign me up! How fast you play is determined primarily by how much you specifically practice playing fast. The thickness or shape of the guitar neck might have some effect on your top speed, but it’s very very small. 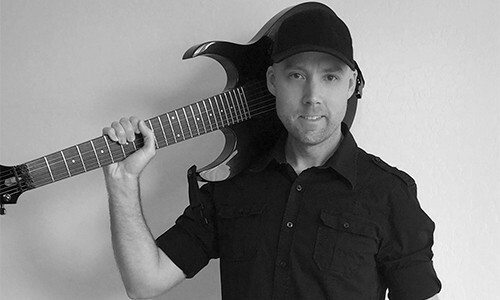 There have been plenty of “fast” guitar players who played guitars with necks that could be described as anywhere from average thickness to “fat.” For example, the necks on the Ibanez Joe Satriani signature guitars are NOT thin at all. Instead, Joe prefers thicker “vintage” neck dimensions, rather than Ibanez’s typical thin Wizard necks. At the end of the day, choose a certain neck shape because it’s comfortable for you, not because you think it’ll make you play faster. The disclaimer here is similar to the one about a guitar’s ability to make you play faster. No guitar should ever be expected to make you a better player. There’s really only one thing that’ll make you better: playing guitar regularly. There’s no body shape, neck shape, frets, pickups, bridge, etc. that’ll make you better. Don’t fall into the trap of buying guitar after guitar in search of the the “perfect axe” that you think will make you a better player. That can turn into a very expensive (and unfulfilling) pursuit. Buy a certain guitar because it feels good to you, makes the sounds you want, and inspires you to play/practice. Do that, and you’ll be naturally inspired to pick it up and spend more time playing. This, in turn, will naturally help you become a better guitarist. A guitar can’t make you play better, but it just may allow you to progress beyond a certain plateau. There’s a subtle distinction there. If you’ve been playing one of those really cheap starter guitars, upgrading to a higher quality guitar can indeed help you continue to progress beyond a certain point. However, you’ve still got to put in the work. Expecting a guitar to make you attractive, popular, etc. Oh man. This one’s tricky because when/if it IS a factor in buying a guitar, it’s often subconscious. We’re rarely aware of it (or willing to admit it to ourselves). If this is the scene that pops into your head as you weigh the decision to go out and buy a guitar, you’re headed for disappointment. There’s nothing wrong with choosing a certain guitar because it looks cool and fits a certain image you want to portray. However, you should NEVER start playing guitar to gain friends, romance, or become famous. If you’re feeling socially isolated or lonely, there are other issues you need to address first. Relying on an inanimate object like a guitar may result in superficial relationships rather than deep bonds. In other words, you don’t want people drawn to you just because you’re a guitarist. You want people in your life because they’re genuinely drawn to you as a human being–because they actually like you. If you’re only wanting to get rich, don’t learn to play the guitar, learn to play the stock market. You’ll have better odds. In fact, if your biggest goal in life is to be rich, there are plenty of other things you can do or learn that’ll give you a better chance than learning to play a musical instrument. Playing guitar for the purpose of getting rich is a terrible plan, and a road to disappointment. I’m elated for all the artists throughout history who’ve seen great financial success as a result of their talent. However, I’m sure most of those artists would tell you that getting rich was never their primary reason for learning the instrument. Before I dig into this one I just want to say: it’s absolutely fine if your guitar just happens to be one that inspires and motivates you to play more. Nothing wrong with that at all. However, we guitarists can fall into the trap of constantly buying new guitars to remedy a lack of motivation to play/practice. Sure, getting a shiny new (or even used) guitar can be a quick shot-in-the-arm to boost your motivation, but it’s often temporary. Once that “new guitar smell” wears off, you’re right back to where you were before. Then what are you gonna do, buy yet another guitar? Maybe a new pedal? New amp? Before you know it, you’ve spent thousands of dollars on dozens of guitars, pedals, and other gear yet you’re still not playing very much. If you’re having trouble with your motivation to play/practice, I give some suggestions in this article–things that I personally do to battle procrastination or feelings of drudgery when it comes to guitar practice. A more realistic expectation is for a guitar that is mostly buzz free most of the time. Your guitar should always be buzz free when playing with an excessively light touch (lighter than you’d normally play). It should be mostly buzz free when playing normally. However, if you hit a note or strum really hard, expect buzz. That’s normal. It’s also normal if you decide on-the-fly to tune a string (or all of the strings) down to an alternate tuning. If you have a guitar that is set up exactly how you like it and it’s 100% buzz free all the time, you’re in a very very small percentile of guitar owners. Based on some of the guitars I’ve seen over the years, it’s obvious that some people out there honestly believe guitar strings last forever and never need to be changed. Your strings need to be changed regularly, regardless of whether they break or not. If they’re visibly dirty or rusty then it’s definitely time for a fresh set. However, even if they still look and feel fine and/or you don’t play very much, it’s still a good idea to change them at least once a year. For the rest of you who play more regularly, how often you change strings depends on how much you play. I play for about 1 hour a day, 5-6 days per week, indoors in my studio (not live), and I change my guitar strings every 3-4 months. On the other hand, I’ve met a few guitarists who change their strings as much as 2-3 times per week. These are usually the pro musicians who are playing regular live gigs each week. If you want your strings to last longer, at least give them a quick wipe with a soft, dry cloth after you’ve finished playing. You might also squeeze a bit more life out of them by occasionally using a string cleaner like GHS Fast Fret or Music Nomad String Fuel. However, they still won’t last forever. If you’re a collector of rare or expensive guitars, a proper display case like this one is the way to go. While it’s natural to want to take care of your guitar (and you should always at least try), it’s probably going to get dinged or scratched at some point. 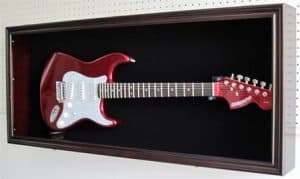 Unless, of course, you’re a collector of expensive or rare guitars, in which case you’re probably storing your guitars in a proper guitar display case and rarely, if ever, playing them. On the other hand, guitarists who regularly play live or otherwise tend to travel a lot with their guitars are a bit more at-peace with the fact that guitars get banged up, and lovingly refer to it as “road rash”, “mojo”, “character”, etc. Leaning it against a desk, wall, couch, etc. The point is: do your best to take care of your guitar, but in the end value it not for how pretty it is but for the sounds (and joy) it produces. Barring major damage, guitars can take quite a beating and look awful without any effect on their sound or playability. I love Music Nomad’s Guitar One as a guitar polish. However, I use it only as a final polisher, not a cleaner. Believe it or not, your guitar needs to be cleaned once in awhile. Your body’s sweat and oils, over time, can build up and gradually break down the finish. You don’t need to go nuts, and you don’t need to constantly use cleaners and polishes on the guitar. For routine maintenance, grab yourself a pack of microfiber cloths. Then, simply give the guitar a quick wipedown with the dry cloth after you play. You really only need to wipe the areas that have come into contact with your skin and sweat, including the strings. If any areas have stubborn gunk or dirt, you can simply fog the area with your hot breath before wiping. If that still doesn’t do the trick, slightly dampen the microfiber cloth with a little bottled water. You only want the cloth slightly damp, not soaking wet. Important: there’s a difference between cleaning and polishing. Don’t polish a dirty guitar, or you risk scratching it. First remove all dirt and dust using the simple method I just described, and only then should you proceed to use a guitar polish or wax. For polishing, I love Music Nomad’s Guitar One. 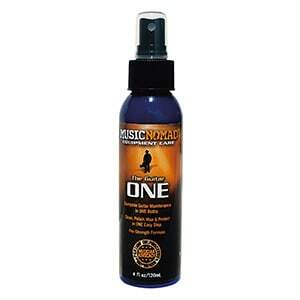 However, even though it says it’s a “cleaner” I only use it as a polish–after I’ve cleaned a guitar. Let’s face it: full-sized guitars can be a pain to take certain places. For example, I hate flying with my guitar. First, there’s the ritual of preparing and packing the guitar–just in case they force me to gate check it at the last minute. Then, there’s the challenge of maneuvering that damn guitar case between people, chairs, and luggage… and then trying to negotiate a place for it inside the cabin, etc. Ugh! Flying isn’t the only situation where guitars present a challenge. Let’s talk for a minute about taking your guitar into the rugged outdoors. I’m primarily talking about camping trips, hiking, beaches, etc. An outdoors-y friend of mine used to take her beloved (and expensive) Martin D-28 with her on hiking and camping trips nearly every weekend. After just a few months, the soundboard developed an unrepairable crack that also rendered the guitar unplayable. Guitars aren’t indestructible. Since they’re made largely of wood and glue they’re sensitive to temperature and humidity extremes, and must be kept dry. The sad fact is that they simply can’t always go everywhere you go… not without risk of damage. Though pricey, carbon fiber guitars like this one from Composite Acoustics are impervious to the elements. Perfect for the rugged outdoors, travel, etc. If you want a rugged guitar that you can take into the mountains, consider a carbon fiber acoustic guitar like those made by Composite Acoustics (shown above), RainSong, or Journey Instruments. They’re pricey, but sound fantastic and are impervious to temperature, humidity, and you can pour water directly on (and into) them without damage. Yep, you can even play ’em in the rain. On more than one occasion, I’ve had a beginner tell me that their guitar has a “serious problem” because it won’t stay in tune. When I dig deeper (or inspect the guitar, if this is an in-person visit), I discover that the guitar doesn’t actually have a problem. The problem is that the owner had completely unrealistic expectations such as “the guitar would only need tuning every few years.” Yes, I’ve heard this exact phrase, and others like it. Expecting your guitar to stay perfectly in tune all the time isn’t realistic. Now, there are legitimate (but usually minor) issues that can cause a guitar to go out of tune more often than it should. However, it’s not uncommon to have to slightly retune your guitar to correct pitch each time you set down to play (assuming you play once a day). If you do a lot of string bending or use a tremolo, you may have to tune more often than that. If you buy a guitar, one of the first things you’d better learn is how to tune it. 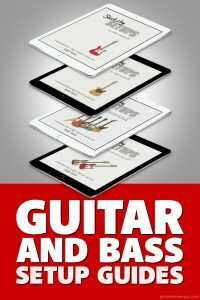 Don’t make a habit of playing an out-of-tune guitar, because this could have a detrimental effect on your ear training which, in turn, can make it harder for you to learn songs, identify pitches, etc. Basic guitar maintenance doesn’t cost much, but it does cost something. You can’t expect a guitar to last if you don’t do some basic maintenance from time to time. At the very least, your guitar is going to need new strings a few times per year, as well as some basic cleaning. Over the longer term, parts naturally wear out, rust, break, or get so dirty they have to be cleaned or completely replaced. Don’t be surprised if, a few years into ownership, you start to hear crackling sounds from your volume and tone knobs, or from the pickup selector switch. It’s not the end of the world; it’s just one of those things that happens, and these things sometimes cost a little money to fix. If you play your guitar a lot, in 5-10 years you may need a “fret job.” This is a moderately expensive procedure where a guitar tech re-levels and re-crowns the frets to remove unevenness and restore them to their proper shape. In 20 – 30 years you may need a total refret–a more expensive procedure where all the frets are removed and replaced with brand new ones. Don’t worry, refrets are rarely necessary, and many guitars make it their entire lives without needing one. I’d like to wrap up by saying that it’s unrealistic to expect one guitar to do everything you want, or for one guitar to be perfect for every style of music you might want to play. While there are indeed some guitars out there that are extremely versatile, don’t expect one guitar to be great for everything from Classical fingerstyle to Country to Progressive Metal. If you find that guitar, please let me and everyone else know what it is. You’ll probably be perfectly happy with one guitar for many years, but don’t be surprised if your eye begins to wander a bit as you progress along your learning journey. 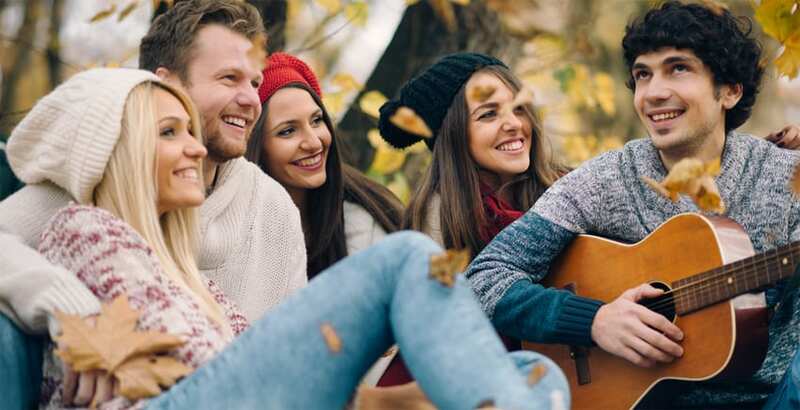 Your musical tastes may evolve and as you gain skill you may want to try other styles or get dramatically different sounds (acoustic vs. electric, for example). This is perfectly natural, and why so many of us own multiple guitars. I have 5 guitars and 1 bass (and 1 more on the way), but all are different and accommodate slightly different playing styles or produce slightly different tones. When you started playing, did you have any unrealistic expectations of your guitar? If so, I’d love to hear them, so please let me know in the “Leave a Reply” section down below. Thank you for the very informative info in these articles. As a beginner I try to find the most succinct as well as pertinent info I can. I am 68 years old and have a very experienced bs meter! I often use compressed air to perform a dust elimination procedure before cleaning which tends to get dustvout if the impossible to reach places. Do you have any input about possibly using air pressure to begin cleaning a guitar (electric)? I have pressure regulation available as well. Nothing wrong with using compressed air, but the same precautions apply as when using it on any other electronic equipment. You do need to be careful with the pressure, and there’s always a little risk of actually blowing dust deeper into the pots or switches. However, if you happen to mess up and ruin a switch or pot, they don’t cost a fortune to replace (authentic vintage parts are another story, of course). If you somehow make the problem worse by, say, blowing some dust deeper into your volume pot, you can always try DeOxit D5 spray. If that doesn’t work, just replace that sucker. If someone is having issues with scratchy sounding switches and pots, or hearing hum when they’re not touching some metal part, often times just blowing out the electronics with compressed air can take care of the issue. But, you do need to use some care.